At the frontline of the war at the Fault, Nova and Quasar continue their fight with the monsters from the Cancerverse. The WorldMind believes Richard Rider is being distracted by the kidnapping of Namorita. Rich comments that he's focused on the job. The two heroes battle their way towards the Kree's stellar flagship. 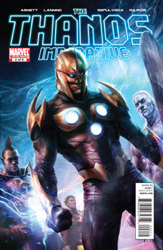 They find Triton, a member of the Inhumans, as a creature attempts to consume him. Suddenly, the Silver Surfer blasts his way through the monster's body! When Nova asks the Surfer if he is there to fight with them, he simply answers that he is only a herald. They turn to see the Silver Surfer's master, Galactus, along with Aegis, Tenebrous and the Celestials as the cosmic abstracts have come to join the fight! Meanwhile, in the Cancerverse, Star-Lord and the rest of the Guardians of the Galaxy continue their battle against the Cancerverse Defenders. Mantis delivers a knockout kick to Dr. Strange while Peter Quill shoots Hellcat in the stomach multiple times. At the same time, Gamora is engaged in a sword battle with Valkyrie which ends with the Asgardian being stabbed through the chest. On another part of the battlefield, the Cancerverse version of the Sub-Mariner fights Drax. The destroyer punches through Namor's chest while ripping his arm off at the same time! Nearby, Cosmo uses his mental powers to cause the Hulk to die from a stroke. As the Guardians group back together, Cosmo is shocked to discover that the Cancerverse Defenders are rising from the dead and have been evolved in their monster states! However, the Defenders find themselves afraid when they see the form of Thanos rising towards them! The mad Titan unleashes his anger and power in a gigantic energy blast that obliterates the entire Defenders team. The master of destruction has the ability to deliver permanent death to the Cancerverse which was the reason Peter brought him with them. Cosmo senses the arrival of another being. The team turns to find themselves facing the Cancerverse's Vision! However, the android informs the Guardians and Thanos that he means no harm. Back in normal space, Major Victory is being taken to a holding cell. He quickly escapes his guards only to find himself knocked down by Lord Mar-Vell. Mar-Vell discovers that his prisoner is one of the temporal anomalies he has been searching for. He orders him to be taken to the cell where the other anomalies, including Namorita, are being held. In the cell, the temporal captives explain to Vance Astro that Lord Mar-Vell is searching for a specific anomaly to activate the Necropsy. They don't know what the Necropsy is but the prisoners are trapped inside Thanos's old starship named Sanctuary! Back at the Fault, the cosmic abstracts unleash a powerful attack against the Cancerverse ships. The Silver Surfer explains that more than just their universe is at stake. The Cancerverse is a threat to all universes since they are capable of remaking the fundamental laws of reality. Suddenly, Nova notices a change in the Fault! A massive face begins to push its way through the very fabric of the Fault! The heroes and abstracts find themselves facing an overwhelmingly powerful starship with the skeletal head of Galactus on the front! It is... The Galactus Engine!